Home » Face » Foundation » Review: Anna Sui Moisture Rich Powder Foundation SPF15 PA++ – Better than the liquid! 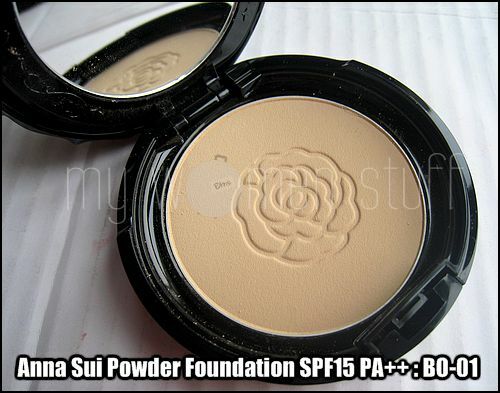 Review: Anna Sui Moisture Rich Powder Foundation SPF15 PA++ – Better than the liquid! When I tried the new Anna Sui Moisture Rich liquid foundation I was not very impressed. It made me oily and the scent was too strong for me. So when I received the powder foundation, I was in a bit of a quandary. Try it or not… try it or not… but curiosity gave in and I tried it. Like all Anna Sui products, there is a rose scent but to my surprise the scent is not all that strong. Not even as strong as the eyeshadows! That’s great! The texture of the powder foundation is light on the skin and I use the Loving Minerals Handy Kabuki brush to apply because I like the sheer coverage it gives. Mine is in BO-01 which is perfect for my skin tone. Unlike other powder foundation that can cake up during the day or dry out the skin over time, I find that this Anna Sui Moisture Rich one does not. I guess its living up to its name of “Moisture Rich”! The packaging is lovely, essentially bearing the signature Anna Sui rose on the compact. However I find it a little too bulky to be toted around as its thick. The purple sponge is a surprise though – I’ve never come across purple sponges before! And the detailing on the mirror is exquisite. Like many Japanese style powder foundations, the powder and compact are sold separately. This jacks up the price of your first purchase but subsequent repurchases of just the refill powder will be easier on the pocket. The compact case is RM52 and the refill powder is RM108 so your first purchase will be RM160. Price wise I’d say its about par with other department store brands. Have you tried this or its liquid foundation sister? Like it? Hate it? PREVIOUS POST: Ask & Answer : What is your favourite sunscreen or sunblock? NEXT POST: Saturday is for surprise poll results and giveaway winners! Heh… not a new phone 🙂 I must agree that Anna Sui really hits the nail on the head when it comes to packaging. Now if only they can tone down the scent! hai paris! just want to wish u happy holidays! And you to too! Have a safe one! I can’t say its the best but its certainly pretty good! I love the rose sdent and I use this for touch up. I’m sorry I can’t help there as I don’t have oily or sensitive skin. I’m not sure if they are still giving out samples but perhaps you can try your luck at the counters? 🙂 Have a great weekend. I got a sample of this before, but the colour match was off, so I didn’t care for it. Must go back and try one in my right colour. The sample pack is equally pretty with their signature rose design! Am wondering, how does this compare to the Paul and Joe one?